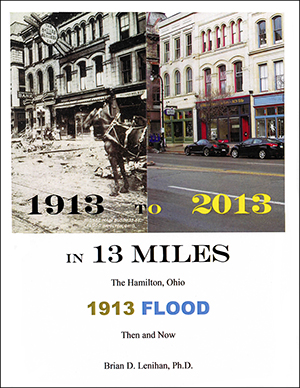 1913 to 2013 in 13 Miles: The Hamilton, Ohio 1913 Flood - Then and Now by Brian D. Lenihan, Ph.D.
by Brian D. Lenihan, Ph.D. The worst weather disaster in Ohio history is the Flood of 1913. The flood hit Hamilton harder than any other city in Ohio. Hamilton has one of the largest collections of 1913 Flood photographs in the Miami Valley. The centennial disastrous Flood of 1913 made available hundreds of photographs of the flood and its aftermath. The availability of the photographs prompted the recreation of over 360 historical 1913 Flood images from the vantage point of the photographers of 1913. THe photographs capture the images of 1913 and 2013 in a 13-mile route that covers six regions of Hamilton affected by the flood.